The “Blog” of “Unnecessary” Quotation Marks: too small to be real? I've been seeing a lot of "knives" stuff lately (which means, december and january when I got the emails I'm up to reading) and I'm not sure what to make of it. I'm sure this is a size matters issue, here. Thanks, Alexander. Since they're not really knives, does that mean I can take them on an airplane? 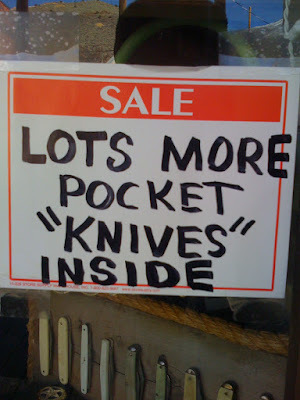 Maybe they have to mark it that way to sell them, since as Surf Ninjas taught us, money can't buy knives. rest assured - they will fit in your pocket no matter what they are. yeah, yeah... we all make typos sometimes. I fixed it.